NH Libertarians Lose Ballot Access – Is taking over the old two parties a viable alternative? The 2018 election is over and Jilletta Jarvis, the Libertarian candidate for Governor of New Hampshire has failed to reach the 4% required for the Libertarian Party of NH to retain ballot access, which it achieved in 2016 for the first time in two decades. I want it to be clear, I really like Jilletta and she was a much better candidate than the 2016 offering from the LP, Max Abramson. Jilletta ran a good campaign and was much more active than Abramson, but didn’t even come close to Abramson’s 4%. She got 1.46%. What happened? It’s pretty clear that 2016 was a fluke. I’d speculated then that Abramson, who barely existed as a candidate, and other “Libertarians” like Gary Johnson at the national level had benefited from people’s frustrations with Trump and Hillary being their main presidential choices. It’s pretty clear this palpable frustration benefited all third parties in 2016, with the Libertarian and Green presidential candidates getting three times their vote totals from 2012. People weren’t voting for the Libertarians and Greens, they were voting against Trump and Hillary. Add to that the fact that major media entities WMUR and the Union Leader set their debate rules to exclude the Libertarian candidates like Jilletta, and it’s pretty clear she didn’t get a fair chance from all New Hampshire media. Shame on WMUR and the Union Leader for excluding their viewers and readers from knowing about their third choice. Of course, the two-party duopoly has long been complicit in excluding libertarians politically. In the 90s when the Libertarian Party of New Hampshire got ballot access for the first time by getting over 3% of the vote, the Republicans and Democrats voted to raise the bar 33% higher to its current level of 4%. She seems enthusiastic and smart, but we were struck at how her libertarian vision differs from some of the party’s more orthodox candidates. She says she’s for smaller government but outlined several programs that would necessitate spending more money. To improve education, she pitched the concept of centralizing public education, with the state collecting all education taxes and determining how to best spend them. That strikes us as anything but a libertarian approach. Overall, we feel Jarvis has some worthy ideas, but her vision for the state seems unfocused, perhaps due to the pressure of trying to appeal to enough voters to garner the 4 percent of the vote needed to keep the party on the ballot. Great news! As of 2016’s election, the Libertarian Party of NH regained ballot status equal to the Rs and Ds for the first time in two decades! I’d previously been registered as a Democrat for the purposes of running for office but this year I made the switch to Libertarian, since it was the first time I’ve been able to do that since moving here in 2006. That’s the short version of the story. There’s more, however. In addition to re-registering to vote as a Libertarian, I also modified the voter registration form to reflect my “state citizen” status and put the Keene City Clerk and Secretary of State of NH offices on notice of that. What is a “state citizen”, you ask? Good question. Here’s my understanding, which the clerk and S.O.S. didn’t contradict. I present to you the notice I sent to the clerk and S.O.S. and the video of my visit to the clerk’s office to change my voter registration and notice them of my state citizen status, under duress. Below the video, I’ll discuss in more detail. Why are we wearing masks at secession demonstrations? 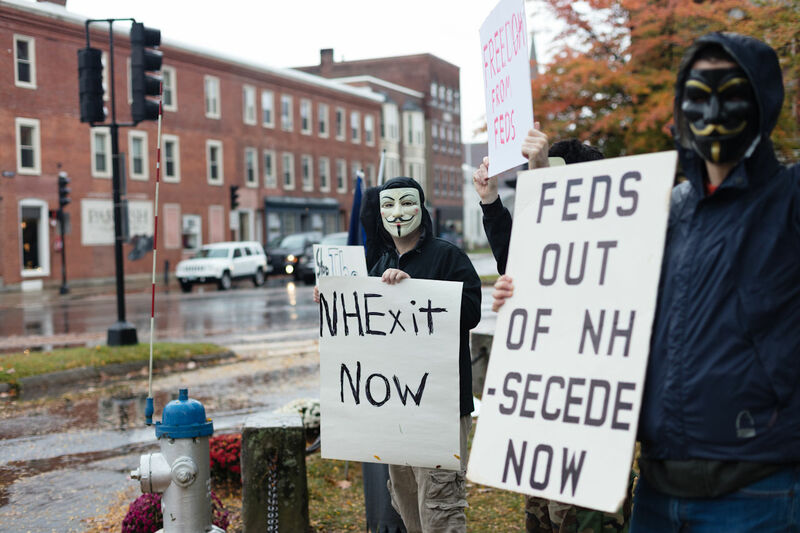 For the last month, activists in Keene have been appearing at Central Square for NHExit demonstrations featuring masked participants. Many of them attend wearing V masks, from the movie, “V For Vendetta”. Why perform masked demonstrations in favor of secession? First, ’tis the Halloween season, so masks are certainly appropriate, but more importantly, masks are just more fun. Many people love to see the V masks and some will even stop their cars to take photos or park and get out to come compliment us. It’s not a coincidence that New Hampshire has arguably the highest concentration of bitcoin and crypto-friendly people anywhere. For more than a decade there have been active migrations of libertarian, voluntarist, and liberty anarchists moving to New Hampshire. Many of these movers are activists who are into alternative currencies and the bitcoin community here has exploded as a result. The oldest migration of libertarians to New Hampshire is the Free State Project, which as of September 2016 boasts nearly 2,000 participants already in New Hampshire, with 18,000 more pledged to move by the year 2021. There’s also the more decentralized Shire Society which has been encouraging liberty-loving people to declare their personal independence and move to “The Shire” since 2010. Here are some more fun facts about the burgeoning bitcoin scene in the Shire: Manchester is home to the world’s longest-running weekly bitcoin meetup, plus regular meetups are being held in Keene and the Seacoast. According to Overstock.com, the highest concentration of their bitcoin orders comes from New Hampshire. 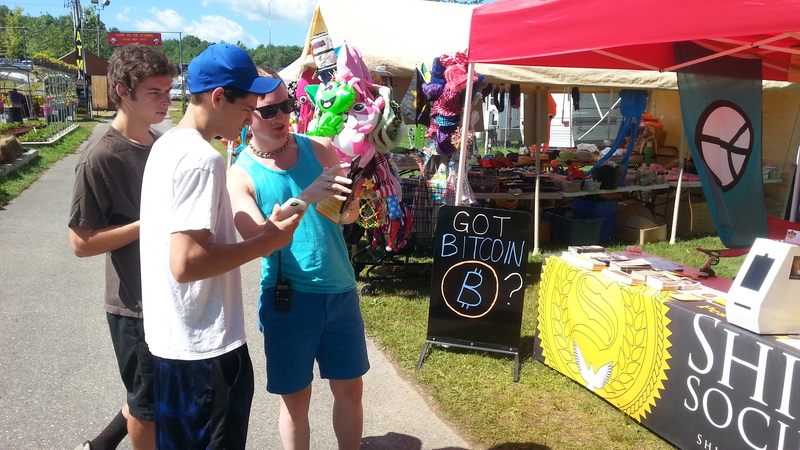 Plus, you can actually use bitcoin in real life here, at mom-n-pop businesses like “Corner News”, “Local Burger”, and multiple food trucks in Keene, plus “Pizza 911”, “Dancing Lion Chocolate”, and more in Manchester. It turns out that Keene, the Southwestern NH city of 23,000 people, even outdoes San Francisco in amount of bitcoin-accepting business per capita! Take a look at CoinMap.org to see the dozens of New Hampshire businesses that are taking crypto!